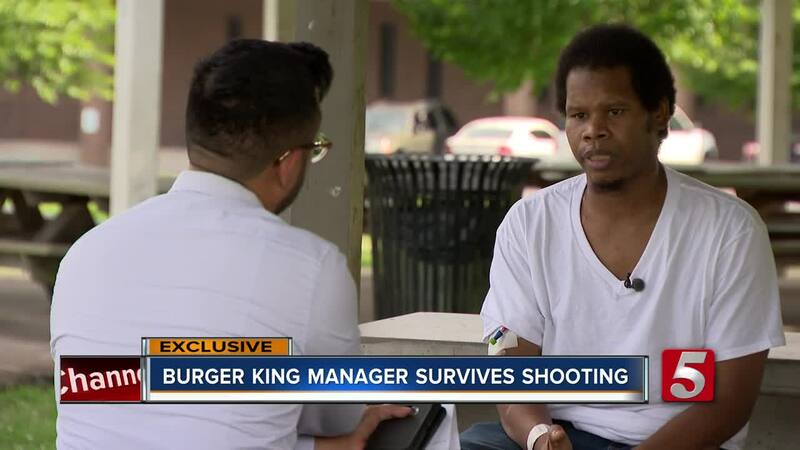 The Burger King manager who nearly died trying to protect his employees said he is thankful to be alive but regrets killing the gunman. A Burger King manager who nearly died while trying to protect his employees said he is thankful to be alive but regrets killing the gunman. Maurice Farris tackled one of three alleged masked intruders who tried to rob the Madison, Tennessee restaurant three weeks ago. Investigators said at least two of the three people were armed and entered through the kitchen. Farris recalled the adrenaline kicking in after they told everybody to get on the ground. "My mind just flew from there. I saw the first guy wasn't really paying attention to me so I literally just jumped on him, tackled him, and took the gun from him, and I remember shooting him. The second guy kind of unloaded the clip on me and started shooting, shooting, shooting," Farris said. Farris shot and killed 18-year-old Kenneth Jernigan, according to police. Farris himself was shot seven times in the leg, stomach and chest. Farris, who's been the manager at the restaurant for five years, was taken to Vanderbilt University Medical Center in critical condition and was released on Sunday. Those who are close with Farris always described him as caring, but his quick actions that night solidified their thoughts that he is also a hero. "I can't say I'm a hero because I just feel like I did the right thing," Farris said. "I didn't want to put us in a situation where they would line us up and shoot all of us, I was that scared." Farris also had his pregnant girlfriend — who was in the restaurant during the incident — in mind during the shooting. While he is being praised for taking several bullets to keep everyone safe, Farris is bothered it ended up costing a young man's life. "I still regret killing him. I feel like God doesn't have an excuse for you to kill somebody so if there was a way I could've just injured him, I'd feel a lot better," Farris said. "I took his life away and it makes me feel bad." Despite what happened, he is looking forward to going back to work, which could take up to six weeks depending on his recovery. "I'm thankful to be alive, that's the biggest thing. I feel like God could've taken me so I feel like he has a plan for me and I really want to know what it is," Farris said. Officials are still searching for the two accomplices who were allegedly with Jernigan. Anyone knowing persons with whom Jernigan was recently associating is asked to make an anonymous call to Crime Stoppers at 615-74-CRIME.